There is just no doubt that one of the problems the NASCAR TV networks are running into is the fact that there just does not seem to be a solid level of excitement in The Chase for the Championship. Sunday in Atlanta, ESPN put an all-star line-up on-the-air. Ray Evernham was added to the duo of Rusty Wallace and Brad Daugherty in the Infield Studio. Allen Bestwick was hosting that venue. Three NASCAR owners with a veteran TV personality were ready to go. 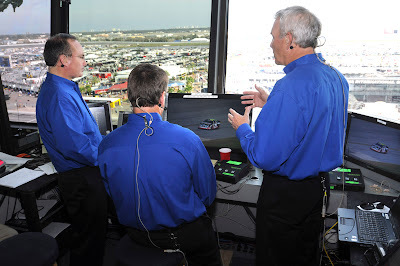 In the broadcast booth was Dale Jarrett and Andy Petree. Two veterans that have a combination of being drivers, crew chiefs and owners. Alongside was Dr. Jerry Punch, who may well be one of the best-known NASCAR TV personalities in ESPN history. Down on pit road was the most veteran NASCAR reporter in the ESPN stable, Mike Massaro. He was joined by the versatile Dave Burns, Jamie Little and the team's full-time rookie Shannon Spake. That put eleven voices on this multi-hour live telecast. Add-in the veteran ESPN production team in the TV truck and the potential for a very good sporting event was certainly at hand. Bestwick and company had fun and previewed the Sprint Cup Series race during the one hour preview show. It would have been nice if the team acknowledged the new multi-year Camping World sponsorship of the Truck Series. Daugherty has been working his enthusiasm for all it's worth, but Wallace and Evernham were the two NASCAR veterans who could really preview the event from an experience standpoint. They kept the energy high and handed-off to Punch and company for the start of the race. As we have seen over the past couple of events, the choice of ESPN was to focus on a story that had been decided in advance. That story was named Jimmie Johnson. While fans are well aware of The Chase, what they were actually watching on TV was the race. From the drop of the green flag, ESPN made it clear the race itself did not really matter. This is the exact same problem that plagued these ESPN on ABC telecasts last season. Why should The Chase spoil the race? With all the cars on the track, shouldn't all of the teams be treated equally by the TV crew and the announcers? ESPN lucked into Johnson having a good first part of the race, but absolutely got lost when Johnson was hit with a penalty and dropped a lap to the field. Why this obsession with Johnson is anyone's guess. Once again, listening to the radio call of this race was a surreal experience. ESPN focused on single car story after single car story while the PRN radio broadcast was calling the racing in the middle of the pack. Dale Jarrett is clearly frustrated with the ESPN production team, as he mentioned many times on the broadcast that there was good racing going-on back in the pack. There was no response from the production team as the focus on the leaders and Johnson continued unabated. When the Infield Pit Studio crew was allowed to talk, they injected the kind of excitement into this race that was lacking with Punch. Ultimately, Jarrett stepped-in and handled much of the play-by-play role for the final one hundred laps. He and Petree handled the load, but they were slaved to the pictures that had been selected for them to describe. The crew offered a couple of half-hearted recaps, but they never just took a deep breath and ran-down the field for the fans. It is almost as if they are scared something will happen to the leaders while they are updating the field. Even the video recaps were quick and very basic. This is a shame, because the pit reporters were on top of their assigned teams and performed very well. ESPN again blasted oldies as the music leading into the commercial breaks. The transition from themed music and expensive videos to oldies from a "Best of the 70's" CD continues to be rough. In the business, this is called using "random cuts." The directing was solid, with the early over-use of the in-car cameras fading away and the good pictures and sound lasting throughout the broadcast. No technical problems on a location shoot this big is kind of like never mentioning the referees after the game. Solid tech job all around. The use of the double video boxes was outstanding, but the pit stops lacked the pop of earlier broadcasts. No timers or triple splits was the order of the day, whether under caution or green flag racing. The pit reporters, however, were excellent in calling the pit road action. There was a restart with 23 laps left, which led to the big accident of the race one lap later. ESPN caught the accident as it happened and showed all the replays. During this incident, Jarrett again tried to assume both the role of calling the action and offering analysis. Jarrett truly is ESPN's star of the show. With an extended clean-up, the Producer turned the upstairs talent around and put them on-camera. This should have been done more this season and resulted in a short but smart appearance by all three booth announcers. The final 16 laps of stop-and-go racing left things a bit in a lurch. Spake and Burns came through with good pit reports while Punch had a tough time filling the air with commentary. With 11 laps to go Jimmie Johnson hit the pits and the TV team was lost. The restart with 9 to go had no reset of the field because ESPN chose to replay the first Edwards win at Atlanta years ago. Other than the ticker at the top of the screen, TV viewers had no clue who was where or why. This is the big problem with ESPN, the lack of basic information for the fans. Even Johnson's position was not reset after his late pit stop. Luckily, Jarrett and Petree had Johnson to feature in the closing laps and gave all the information they had on his situation. With Edwards checked-out, Punch had to call the action as Johnson cut through the field. What viewers heard was silence and car numbers. Jarrett called the race to the end. Nice coverage of the finish line and a great late pass by Johnson helped to end the race on a high note. Somehow, that did not really make-up for the previous four hours of mediocrity. Another tough day at the office where NASCAR and ESPN are concerned. The Daly Planet welcomes comments from readers. Just click on the COMMENTS button below and follow the easy instructions. The rules for posting are located on the right side of the main page. Thanks for taking the time to stop by. I posted this in the In-Race comments, but deserves to be repeated. Albuquerque KOAT 7 just dropped coverage with 8 laps to go for a New Mexico 1st Congressional District US House of Rep political debate. They said it would be on ESPN2, but that must be on the local cable. I have DishNetwork and am not getting it. Thanks for killing the NASCAR race with 8 laps to go. Some of us have satellite and not cable so you've just screwed us out of seeing the end of the race. As if ABC's coverage wasn't bad enough, now you go and do this. Wouldn't it have been better to start the debate maybe 10 minutes late and let those of us that have invested all afternoon watching a LIVE sporting event see the end of it? Thanks for taking the time to report that information. JD, you act as if TV networks covering the chase drivers is something new. NBC did the same exact thing when they broadcasted the chase. In fact, they did ti much worse. I really think ESPN has improved by covering other drivers. They interviewed non-chase drivers pre-race. Dave Blaney was interviewed after the wreck. McMurray, Waltrip, Montoya and other were talked about more than some chase drivers. I dont really see it as being such a big problem. This is The Chase. It should come as no shock those drivers will be talked about more. If the oppisite took place and non-chase drivers were talked about more than chase drivers there would be a bigger uproar from both NASCAR and fans. Once again I believe you are taking your frustrations of a bad PXP out of the entire ESPN broadcast team. Your columns each week involve talking about the Chase. So why dont you take your own advice and talk about some other TV issues? I appreciate your opinion but what NBC did or ESPN did last season has absolutely no place in this discussion. Eleven veteran voices resulted in a boring and disjointed 4 hours of racing. How is that possible? It is because ESPN is obsessed with The Chase. The simple reason why is that ESPN is not involved with the Cup Series until the end of the season. Meanwhile, we have been watching this sport since February and I would respectfully suggest that fans do not change their favorite driver or team because of The Chase. Suddenly, any car outside of a front-runner or Chaser becomes invisible. How is this good or healthy for the sport? What ESPN needs to do is work to figure out how to strike a balance between the 42 teams and the 12 running for the championship. I truly believe this is the biggest obstacle in the coverage. Again WCVB Boston stayed till the end . I went to the ABC broadcast and thought Dale Jarret did what seemed like PXP very well. The mix seemed to work. Maybe with 3 races left they could try to mix things up a bit. I've said this before DJP Knows racing it seems the PXP is just not his thing. But when it comes to just running things he seems on it. Take the pressure off DJP as PXP and he seems at ease. AB in the booth ,DJP in the infeild studio, who knows. Jerry Punch is a smart well respected man ,let him work where he is best suited. Well, I did not think the race coverage was awful. I rather enjoyed the race. Sure, there are part I don't care for, but it does not keep me from enjoying the race. Our family watches a lot of football. There are players whose names have never even been mentioned. They are not even introduced at the beginning. Most of the universe does not care. One of our best friends was in the PGA. He was even in the Ryder Cup one year. No matter who did the broadcast, CBS, NBC or the golf channel--he was practically never mentioned. That's just the way things go. He was not a star. I love racing. I love Nascar, and I am a huge fan of Carl Edwards and Matt Kenseth. But I absolutely destest watching the Sprint Cup Series on HDTV. Well, to be more exact, I HATE listening to ESPN's coverage during the race. It seems that when either of my guys is out front, making passes, or anything positive, I'll never see, or much less hear about it, because announcers are so immersed in covering every millisecond of the #48 team. I refuse to say the names of the driver and the crew chief, because I hear thier names repeated over, and over, and over during the broadcast. My teams both performed well today. But of course, most of the time I didnt have a clue as to what was going on with them, due to #48 ran into problems, went a lap down, came back, blah blah blah. What fueled me to really write this response, was the final laps of the race. Sure, #48 is leading the points. Yeah, He came back to second place. But they hardly EVER talked about Carl as the checkered flag approached. In fact, with Carl's tremendous lead, you never saw him but for a millisecond while the cameras were following and talking about #48's up and down day. But at the very least, the showed the #99 cross the start\finish line for the win. But the bogus coverage didn't stop there. Of course they showed Carl's backflip, but quickly clicked over for the #48's crew chief for a word. They allowed a cool, calm Bob Osbourne to say a few words, but quickly switched the moment that the driver of the #48 got out of the car for questioning. Even in victory lane, after Carl gave many a thanks, Carl himself pointed out that "they have been raining on his parade all day." Which is true, with all the negative commentary in an effort to make the races "more exciting". Give me a break. ABC: I will watch your network, simply because your race is airing on your network, but I will not listen to your biased trash that you are attempting to force in my ear. I applaud Dale Jarret for trying to bring sanity back, but his efforts were in vain. This is Nascar. Not the damn Ji**ie J***son show. Go Carl! TV may not like talking about you, but you got the win. Screw them, let em hate. Your right JD. Espn needs a nice flow to their show. If they could look at the race as a race with 43 cars. Follow who is in front, follow the top 10. I am sure you will have a few chase drivers in there to report on. Follow further back. Just go with a flow and the events will come to you. So True! QB,RB,WR are like those in the chase....all others on field just like 13-43 in the race. JD you were much kinder in your comments than I am about to be. Yesterday we viewers were treated to espn as it should be, as it could very easily be. And yesterday was supposedly the B team. Promotions are in order there. Today, with the A team, we got scraps. 2 day old leftovers. Junk. Scripted coverage that is inflexible,in a sport such as auto racing, is inexcusable. Talking points sure - they must be flexible enough so that when a chosen lead story goes a lap down, blows a tire or whatever, the booth & truck can adapt quickly, and cover the newest story on the track. If the scripting were to be dropped, and preconceptions set aside & the race on the track was followed and reported there would be more than enough to keep 11 people very busy. The 1 car per box, 2 boxes per screen is awful, tight shots of racing is worthless. I do not - for the life of me - understand how this junk could be construed as race coverage. A full field recap was not on the menu all day. Where cars were on track was left to the ticker, why & how was left unexplained, unless it was a top 4 Chaser or a golden child. The booth fixation with JJ was weird to say the least. Pre-taped racing in a box was also prevalent again. Under green flag racing again. The complete and total disdain for fans of racers not in the Chase was open & obvious. Even when they got into the top 10 they were ignored as long as possible. If not in the top 10, even when next to JJ pictures of the car were so tight you did not know who was around them. As far as 11 voices who should have been able to give us a decent broadcast - chock full of relevant info, and a full field recap; well a choir of angels could not have helped them today. The truck would not allow it. And they would have been drowned out by the "Full throttle" nonsense.junk. JD I must respectfully disagree sir, it was not even passable coverage. It was same old same old. Was it better than last year? Not by much. The difference with production & content is different voices. All of the things ( not people) that were appalling last year are still in place this year. Scripts, graphics on screen during green flag, lousy PxP, disdain for fans, lack of relevant info - all still hanging on at espn by any name, any channel. Could someone explain exactly what they are the world wide leader in again? It certainly is not accurately, timely live event coverage. Maybe Jimmie is like Tom Brady was last year. Tom was trying to finish a perfect season. It had not been done for decades. The NYG got no respect. Jimmie is trying to do something that has not been done for 3 decades. Jimmie is also the winningest driver this century. Even Dale Jarrett said JJ is probably one of the top 5-10 in the history of the sport. I can see why he gets a lot of ink. Even though Edwards won, he only gained 15 points on JJ. He is still 183 points behind. That's part of the story. @ jojaye I personally like " Crank It Up " for the surround sound " Full Throttle " would be good but alot of chatter makes it hard to Crank It Up, otherwise we are totally on the same page. @3bud - I love Crank it up too. And it makes sense. 43 voices saying green or go or whatever is pointless! Do we really need 11 people to broadcast a race? I understand the 3 in the booth. But why Rusty (we have Dale), why Ray (we have Andy), and why oh why do we have Brad? If we have to have Ray, couldn't he do double duty and replace Tim Brewer? They only need 2 pit reporters as the drivers are never interviewed once they fall out the race. Here's what they should do. JP and Ray do the infield thing, AB, DJ & AP in the booth, Mike Massaro & Shannon in the pits, and Ray doing the cut away car segments also. Saves alot on the payroll. As for the race coverage itself, there only seemed to be 15 cars in the race today. Some have written about that some NFLers and Bballers don't get mentioned. That's what's supposed to make NASCAR different. Is is ESPUs choice to cover only the Chasers, or NASCARs? If JPM wasn't the odd wad running in the top ten and then wrecking, we would've never known he was on the track. No wonder Sam H wrecks every week, he gets TV time. It's hard to make chicken soup out of chicken you-know-what, and with the COT and its strung-out, noncompetitive racing, it's hard to figure out a way to cover it. The only time there was side-by-side racing was on the first ten laps after a restart; once the tires wore down, it was follow-the-leader again. That's not ESPN's fault, it's NASCAR's. Now, ESPN could do a more imaginative job covering the races--and thank god for DJ, who is the only thing that makes the coverage bearable. I've been a race fan for 30 years and NASCAR has done all it can to destroy my enthusiasm for the sport, and its broadcast partners have done their part as well. Next year I won't buy Trackpass, Hotpass, or any of the add-ons; there's no racing of any quality to make those expenses worthwhile anymore. The coverage by ESPN gets worse and worse. I wonder if they had some interims or something working today in the truck. There was several graphic misques. During one of the busy pits stops, a label saying "88 in car cam" was at the top for a minute, and they werent in the in-car. There was a point when they had a split-screen saying that Gordona dn Jr were battling, but at that time, Jr had a good 3/4 of a turn or better lead and wasn't even in the shot. Towards the end, the camera focused on Carl Edwards while Johnson and Hamlin were battling for second. That happened several times. ESPN is hopefully hanging their heads after this one. Its pretty sad when PRN or MRN can cover a race better than someone on TV. ESPN needs to remove half of the TV monitors away from the booth. When they show the commentators in the booth, the whole desk has about 6-8 monitors, and that's just what we can see. Their ratings were down 12% last week, wonder how much further they will go down. And It doesn't help that Johnson now has a 183 points lead with only Texas, Phoenix, and Homestead to go. Jo you don't think HotPass adds alot. I've been a fan since the 70's as well, the racing may need some help (NASCAR needs to give the teams alittle more wiggle room to work with) but HotPass seems to deleiver on updates on the entire race. Trackpass, brings the scanner chatter you don't get all together with HotPass, I guess no FCC rules. It aint free but I think for what we get it is worth it. SPEED needs to completely revamp Victory Lane and make it into a proper post-race show. Start it live after the race coverage ends. If ESPN can have Baseball Tonight live right after a World Series game, SPEED should do the same for NASCAR. We need some post-race coverage. WOW! sorry to hear how RUDE your tv station is. Cripes the race got great the last few laps. I have nothing to say about the race w/o repeating myself but am glad to hear coverage was decent on memphis race. But we have seen these Bipolar episodes before. NW series good or very decent, CUP races....ugh. ESPN will never change nor will France. As long as he reeks in millions he doesn't care. Kind of like Mike Brown, owner of Cincy Bengals...team always loses but he still makes MILLIONS off the various revenue...I heard the Bengals got skunked today...While we SCREAM AT ESPN I have to lay some blame on the France family for 'allowing us to be given such bad coverage' just like we did for the Dega race and apparently some cup races since then...i just partly paid attention today. Will watch VL. The argument of athletes in other sports not mentioned during an event should have not be brought up during a Nascar race. PRN did an excellent job today of talking about racing all over the track. The only downside was when I listened to PRN, I kept seeing the #48 on the track instead. I guess if he goes to the garage for an accident next week, we'll have picture-in-picture of garage/race for the duration of that race. Anyone who disagrees with the criticisms of ESPN's chase should ask themselves: "Why is it ok to watch this trash, when the coverage was different (and better), for 25 years previously"? I won't beat the dead horse of what needs to be changed, because everyone knows what needs to be changed. ESPN, please spare us the last 3 weeks of the season and make those changes early. Here's to no script in Texas! Also, I gotta give credit to Dale Jarrett. He's the lone bright spot to come out of 2008 ESPN. I'm tired of complaining about the same thing each week. I am a 48 fan and except for watching him blow by 10 cars in the last 10 laps the JJ coverage was totally unnecessary. DJ and AP were the only ones doing PXP and that's not their job. I know there was racing today, I use Pit command and racetrax it's a shame we didn't see it on TV, I think it was a little better than last year but still needs work. To top it off I'm having Nascar.com issues and can't get the videos to work including the post race show (black screen "undefined") and can't even email them to complain. I really wanted to hear what was said in the media center. Andy, Allen, Jamie, and Dale are why I watch ESPN/ABC. Anyway, I hate seeing Dr. Punch struggle in a role that he isn't comfortable with and he repeats "for those of you that just tuned in" every 30 minutes. Solid sound, solid pictures, solid pit reporters, and actually covering drivers outside of the chase. TV coverage is not killing NASCAR, but NASCAR is killing itself. I don't get as upset at the coverage as last year. It has been the same scripted mess since ESPN took over. The previous comments have said the same thing over and over, without reaction for the cup races. The Nationwide race was A+ yesterday. How one network can broadcast 2 races so differently is beyond me. I'm still watching the cup races, I only have one tv choice. I don't even make an effort to watch supporting ESPN coverage, it's not worth it. Practice, qualifing, and the race all see to have a pre-planned script. Last time I checked this is LIVE sports. It should be treated as such and the network should follow the show, and the players. If lower budget radio can do it, I'm sure "The worldwide leader in sports" can. I did have hope of change when the camera showed some racing around the track a few times, but someone straighted DJ out, and there was no more. Unless it involved the script. not sure where to post this JD but the HORRIBLE LOUD ROCK MUSIC on VL is RUINING the show...loud music as Jimmy and Kenny talk abou the race. Whatever sound producer who must be 18 years old, thinks this is a good idea, please STOP IT. As much as I was mad a few wks ago at my local ABC station to bump the pre-race, I have to say the couple of races that have run overtime (which is an easy correction if you START THE RACE EARLIER), they have stayed w/the racing to the end & even showed all the post-race, as little as it mite be. Coverage is still a mess tho. I'm listening to P/MRN now, which pains me because I really like DJ & Andy. I did hear DJ stick up for Jr. after playing the radio transmission; yes, I do switch some back & forth a little! I don't usually comment on the race itself, but here goes anyway. I generally get too engrossed in the action,(yeah, I know, what action we see), to notice what the broadcast team does or doesn't do. I do notice when there are things happening that they don't talk about, and I want to know more. I do also sometimes notice the scripted approach. I watched the the CTS, and Nationwide Series yesterday,and enjoyed them. They were both better done by the respective broadcast teams. What I would have liked to see/hear was a more detailed description, and follow up on the pit box issues between Johnson & Edwards. I noticed from the Jayski Pit Stall Selection page, (thanks for the feature Jay), that The Carl's crew Chief had chosen stall #2, directly behind Johnson's pit. I thought then that it was a bad choice. The guys I watch with thought I was full of "stuff". The first pit stop showed what a mistake it was when Johnson short pitted, and cocked the car's rear out into Pit Road forcing Edwards to make a wider, (and slower), swing to get out of his stall. I said then that it was deliberate, and subsequent pit stops bore that out. Although it was mentioned in passing at times during the race, I would have liked to hear Petree, and/or Brewer comment on the strategy, and the, (in my opinion), strategy error by Osborne. I would have liked to see/hear an analysis about what Osborne could have been thinking. Was he playing head games with Knaus? Did he hope to disrupt Knaus' pit stops by having The Carl "long pit", and angle his front out? Apparently Edwards was aware that he should be doing that because I heard him mention it. I feel, (there's that word again), that these kinds of in depth analyses of the thinking by two directly competing teams add greatly to a race broadcast. Overall, I didn't come away with a highly negative feeling about the broadcast as I have in some races earlier in ESPN's coverage this year. I agree that the chasers aren't the only story. There are definitely other stories going on. I have a scenario from today's race and was wondering how the readers here thought that it should be handled. And I admit, my focus was not on the broadcast, but raceview, but I knew when to look up depending on who was around my driver. My driver went a lap down about 1/4 the way through the race. He definitely had his struggles, but the team worked on the car, and finally got it to be competitive. Unfortunately, he was never able to get far enough up in the line of the lap down cars to get the lucky dog. But while he was a lap down, he passed a lot of lead lap cars, even JJ. At one point was consistently running the fastest laps on the track. But, I don't think that there was a mention of him during this time. If the chasers are a lap (or more) down and get mentioned, shouldn't the other drivers get mentioned too, especially if they were having that kind of performance? You are free to agree or disagree with anything on this blog or anything on the Internet. What you are not going to do is insult me. How do you think change comes about in TV? Raising these issues is something the mainstream press runs from like fire. That is the point of this commercial-free blog. I put up a view and folks either agree or disagree. Either way, the topic gets discussed. If you would like to return and offer your views on the subjects you mentioned you are welcome. Anything else in regards to me should be sent by email to which I will promptly reply. anon 6:23PM and jo from sc: until these last 2 races, i would have agreed that the biggest problem w/the race broadcasts is the COT, not something espn can fix. but, i've been listening to prn and muting espn and i've been hearing about some great racing back in the pack that we never see. maybe some of that is hyperbole from the radio team but it's more likely that there is, in fact, some good beatin' and bangin' happening but it's not on camera. chris: one of the biggest flaws in the way nascar media covers the sport is the lack of balance. i'm not saying every team is equally deserving of the absolute same level of coverage b/c the better teams will always get more coverage. but the disproportionate amount of attention paid to an ever-diminishing number of teams is unprofessional and angers fans of those teams not so chosen. see robyn's post for an eloquent argument from a non-chase fan! EVERY team has fans -- every, single team, no exceptions. and those fans aren't unrealistic: they know their team is racing in the shadow of the chasers. but there are only 43 teams racing each week and each one of those teams deserves some attention. it's not 12 teams, racing each other on a track all by themselves. but the way espn covers it, it may as well be. rockin rich: in re: pit selections by the #48 and #99 teams: excellent observation and one that i pondered as well. it would have been a great story. alas, it wasn't developed by the team today. i've made my comments about espn's poor performance of cup broadcasts repeatedly and so i'll only add this thought: it's just so frustrating to spend time with espn on the n'wide side, be impressed with the work done by that team, and then have it fall apart on the cup broadcast. Once again the HotPass coverage illustrates that there is plenty of racing going on. I have no idea why ESPN refuses to show these battles. The call by Randy Pemberton of Johnson's charge should be on every NASCAR show this week. His knowledge and love of the sport came through loud and clear. To a degree I don't envy the position ESPN is in. Some of that is forced by NASCAR as well. FOX doesn't have to go against so many ratings hogs as ESPN does in the second half of the season. Many race fans are college football, NFL and MLB fans. NASCAR has to go against 2 of the 3 almost every single weekend so ESPN caters to the "majority" of fans and discusses the Chase drivers. Right or wrong isn't the issue, the issue is that some producer has their head clearly lodged in their hind end. ESPN has tried for 2 years to make this JP experiment work, but it HAS NOT clicked. He is a GREAT guy and a GREAT asset to the network, but NOT as a PBP guy. Someone at ESPN, PLEASE take this under consideration! I'd like to see Nationwide get their own crew, like what we saw yesterday in Memphis, and the Cup series get the BEST people in their BEST roles. Keep the pre-recorded pieces for pre-race. Hell make your show an hour before the race, just use that stuff then. NOT during the race. Tech center, keep it simple. Covering multiple stories, your version of Picture in Picture is horrid. Run the primary story full screen and any sidestory/battle in a small picture in the corner of the screen. Dont take away a third of the screen with stupid graphics and dead space!!! Throw out the script, highlight the major stuff, let the race unfold then pick your stories that are relevant to the action to discuss. Long debates and discussions should NOT be carried out from race start to checkered flag. Talk about it before the race or after the race. Period. INTERVIEW EVERY DRIVER THAT FALLS OUT OF THE RACE. Using this new PIP (which is older and simpler) to show the interview, while still being able to cover the action. There is ZERO excuse why we are not seeing ANY green flag action unless it is a MAJOR story and is held to a minimum. Reset the field before critical restarts! Long green runs, hit every lead lap car if possible! Chase or not! ESPN has gems, they are just being wasted because someone is producing a SHOW, not a RACE. I too wondered why the 99 picked the #2 pit. And then Osborn has the nerve to complain about the 48. Wild! You never see the number 2 car select the 2nd pit. You choose the pit where there are openings. I wonder if the 99 team was trying to spy on the 48 to see what their strategy would be. --It did not help them, the 48 still came in 2nd and only lost 15 points out of 193. The 99's pit selection cost them spots on several occasions. Strange decision, hope SPEED asks about it at Texas during the weekend. We all know the ESPN coverage leaves a lot to be desired. But, what about the content of the coverage? Is the content a direct result of the boring Chase or has ESPN been mandated by Nascar to only cover the Chasers? Is Nascar trying to cover up fan apathy due to the fact that Jimmie Johnson is again running away with the title? Is ESPN only hyping JJ because they feel he's the only feel good story? And finally, why does it appear that the comments/complaints of thousands of Nascar fans continue to fall on deaf ears, and does ESPN even care? The end of windtunnel was great. Dave sent Robin Miller a boatload of Dale Jr stuff for his birthday. to david @ 9:26: BRAVO! i stand and applaud in your general direction, sir. anyone who asks "why do you folks want espn to do?!?" should read what david has written. brilliant! I think the problem is that with NASCAR, you can't have a race with only 12 cars, as a race with 12 cars wouldn't be very exciting. But let's be honest here, the Chasers are what matter. They're racing for a championship. The Phillies are playing the Rays for the World Series right now, and you know what? No one cares about what the Cubs or Angels are doing right now. The cars from 13-43 are essentially "filler." And while you may be a fan of them, the fact is, they're not in the playoffs, they're not racing for the trophy. Now, if I believed any of that, it'd be fine. The problem is, I don't. ESPN doesn't seem to understand this. Some guys are racing for rides next year. Maybe they're racing in hopes of getting a new sponsor. But what matters is, they're racing. The reason no one cares about what the Cubs and Angels are doing is because 1) you can't put the Cubs or Angels on the field in this game and 2) they wouldn't be crazy enough to schedule other baseball games that meant nothing against the World Series. I just don't think they get that fundamental difference about NASCAR. Heck, with a points format, even in the Chase, some of the Chasers aren't even really in it anymore. Sure, they're mathematically in it, but ultimately, they're out. First off, didn't Edwards enter this race fourth in points? So with qualifying rained out, Jeff Burton would have been the second driver to select a pit stall followed by Biffle and then Edwards. As for the complaints about ABC/ESPN not covering non-Chase drivers, yesterday watching the Truck race, I noticed that at least five trucks were quickly out of the race after 20 laps. I don't remember a mention of them and none were interviewed. Admit that similar to ABC, Speed Channel also greatly concentrates on champinship contenders Hornaday, Bodine and Benson plus Cup drivers Newman and Kyle Busch and not much else. OTOH, I agree about the fine coverage of the Nationwide race and it was refreshing to place the storyline of the many good young drivers on an equal footing with the championship fight Bowyer and Carl Edwards. Rick, I know I'm late to the dance here, but was KOAT producing this debate? If so, maybe they could've started late. I think the problem may be that in election years (presidential) networks, their frequencies on loan from the FCC, are required to provide this programming. Much like they're required to show the DNC and RNC. So unfortunately, their hands may have been tied. On DirecTV, I used to get the west coast networks, which were the DirecTV standards, as well as my locals. Is this not the case with Dish? Because unfortunately, if it isn't, there may have been nothing they could do, regardless of how upset they or you were about it. But, not here to talk about that...JD, is there an email address to ESPN or anything, that fans can start sending in complaints to? It seems like there are some excuses being made for ESPN even though their coverage is severely lacking. Someone mentioned only important players getting mentioned during sports games...but the 43 drivers would be more like teams than individual players...and every team in the NFL, MLB, NBA, etc. get full coverage of their teams in their local markets. Teams don't get penalized for having a poor record by getting no coverage. Yet, that's what happens when ESPN covers a race. Second excuse was that ESPN is up against a tougher ratings market, which I assume is because the NFL is on TV at the same time (for Sunday afternoon races). But I fail to see why their being other sport options on television has anything to do with ESPN's poor race coverage, poor play-by-play, or any of the other frustrating things they do to longtime fans and viewers. Another excuse made is about the COT or the actual racing. It looks that way when ESPN shows extensive single-car shots or in-car cameras for nearly full laps, but those who are at the race, listen to MRN/PRN, have HotPass, or even follow on FoxTrax seem to have a much different opinion. In all honesty, while listening to the radio and watching the splits on FoxTrax today, I tried turning the TV off to see if it would make things better or worse. It turned out that I actually got to see when cars were getting passed or were switching places back-and-forth (ie...hard racing!!! ), got to keep track of who was faster on each lap, and basically knew about a caution before most TV viewers since ESPN would be at commercial whenever I clicked the TV back on to see if there was a wreck or what happened. If you have to do everything possible to follow the race by NOT actually watching it, you have BIG, BIG problems. As a Johnson fan, I had no idea why they chose to put so much focus on his day. They talked about how AMAZING it was that he came from having a speeding penalty to get back to where he finished, but really all he did was take a pretty good car, get past some cars who were lapped based on time, got a free pass, and then took a pretty good car and slowly moved it towards the front of the race. Even if he never got the free pass, lapped cars finished in the Top 20, so it wasn't until the end of the race when he made a smart pit decision and a furious charge to front where they should have really been talking about him. Yes they could mention him, but there were several Chase drivers like Stewart, Bowyer, Burton, and Biffle who fell a lap down at some point, but barely ever were mentioned. Carl Edwards said it best to Dave Burns,"You've rained on my parade all day". Most days that is exactly what it looks like the pit reporters #1 job is. ESPN needs to learn that they should actually cover the racing when they broadcast an event and then analyze it afterwards, during the week on Nascar Now and using their online journalists. Instead, they dictate what the storyline will be, frequently update things like where the points would finish when there are over 200 laps remaining, and not rain on a race winner's parade by basically embarrassing him in his post-race VICTORY interview. A race win is a race win, but since the ESPN storyline was on Johnson the entire day, everything revolved around him. A lot of things go along with winning a race...more prize money, a happy sponsor, name goes down in the record book, and so on - yet ESPN chose to treat Edwards' win as if it was not good enough. Johnson can afford to be happy with a 2nd place finish as the points leader, but there are a lot of guys who should and are happy with race wins, Top 5, Top 10, and Top 20 finishes. ESPN continues to diminish them with the CHASE, CHASE, and more CHASE coverage. My argument about a tougher TV market is based on the idea that they are trying to romance a casual fan into watching the race by mentioning drivers who have extremely popular/loyal fanbases. Ala, Jr, Jimmie, Jeff, Carl. Putting an emphasis on your championship guys is understandable, but you have many players in this race and isn't the benefit of having tv coverage the fact that pictures tell the story? Why not show a side by side battle, even if its for 25th with guys 2 laps down. Show that battle, use PIP to show the leaders or a front battle. Theres no excuse to not see a battle. In fact you should be having an issue of not having enough cameras to cover the action, instead you have TOO many cameras not showing enough. Keep in mind as JD has said several times, its the same crew that has worked all season on FOX and TNT, the only change is production. As for SPEED not interviewing the guys to fall out early, I see your point. However the Truck and NW series have an issue of start-and-park drivers, what bothers me is not the fact that these guys exist so much as the fact no network is willing to address this as a legit issue. There are teams out there that are willing to run the full races but since they don't have the funding they can't accomplish it. If the ESPN crfew would simply cover the race that is happening, rather than the one they wish were happening, their broadcasts would be much better. When you can learn more about the race by reading the telemetry on PitCommand than by watching what's on the air, that's a real indictment of the network's poor coverage. "ESPN needs to learn that they should actually cover the racing when they broadcast an event and then analyze it afterwards, during the week on Nascar Now and using their online journalists. Johnson can afford to be happy with a 2nd place finish as the points leader, but there are a lot of guys who should and are happy with race wins, Top 5, Top 10, and Top 20 finishes. ESPN continues to diminish them with the CHASE, CHASE, and more CHASE coverage." I think the problem may be that in election years (presidential) networks, their frequencies on loan from the FCC, are required to provide this programming. Much like they're required to show the DNC and RNC. Sorry, no TV station or network is required to show any debate or any other programming (except that lower-third animation telling people that the DTV transition is coming). Election year or not, there is absolutely NO such requirement, be it debates or the nominating convention, or anything else. I must say, I didn't start watching the race due to prior commitments earlier in the afternoon, but when I turned it on, I saw the same old same old. ESPN followed Kenseth and Edwards around the track lap after lap as if it was a qualifying run and no one else even existed. Then they went to a double box with JJ in one and Edwards in the other. Again, it was single car shots. Needless to say, I only watched about 30 laps of the race. I didn't bother to post because it is becoming monatonous. It is the same old ESPN trash being produced each week. Apart from the top 10, I still have no idea where anyone finished and quite frankly I have no interest in finding out. Right now, I just don't care. ESPN has given me NASCAR fatigue. If the guys who are at the track can't get excited about the race why should I? Never in my life did I ever think I would watch something other than the network feed of the Cup race on a Sunday afternoon, but that day finally came today. I've always used NASCAR Hotpass as a complement to the network coverage, but today ESPN drove me over the edge and made me spend my afternoon watching exclusively NASCAR Hotpass. Sadly, a service that is designed to provide dedicated coverage of four cars and four cars only gave much better full-field coverage than the ESPN network broadcast that should be designed to cover all 43 cars in the race. The first half or so of the ESPN broadcast I did see before tuning away was another nonstop barrage of the execution of an ESPN script, this week’s entitled "Jimmie Johnson's Going to Finish Bad and Spice Up This Points Race!" ESPN tried as hard as they could to make the script work. It started with Dr. Punch emphasizing the point that while Jimmie has a big points lead, he could still leave this race third in points. Dr. Punch then followed up his support of the script by going on and on about Jimmie's practice "struggles". The truth was that there was no need for concern at all, as DJ and Andy put that myth to bed immediately by calmly explaining that while he didn't look fast on the 1-lap speed charts, he actually had a great long-run car. I sure hope discipline is not in store for those two daring to break the ESPN script and add a taste of actuality to the broadcast. Then ESPN framed the poll question around the script by asking "Which track left will Jimmie do the worst at? ", presumably hoping the fans watching would buy into their "doom for Jimmie today at Atlanta" script and vote for Atlanta. Unfortunately for ESPN they were left with egg on their face, as over 50% of the smart race fans that responded picked Homestead, thinking logically that he'll be in one of those "finish 35th or better to win the title" scenarios and will ease home in the finale. Punch tried his hardest to defend the script though and immediately said something along the lines of "well, despite what the voters said I really think today’s gonna be the day where he finishes bad." I would assume the majority of viewers at home just shook their heads at that just like I did, and just like the 70-80 percent of the poll respondents that didn’t pick Atlanta did. Then Jimmie Johnson got loose and lost a position. The announcers followed the script and screamed comments along the lines of "He almost crashed!, He could crash any minute now! I see it coming!" The production truck followed the script as well by putting Chad Knaus on TV, anxiously awaiting panic, headset slamming, or punching of the pit box, since afterall the script said this would be the day when bad luck strikes the 48, and surely in their mind this was the start of the trouble.... Unfortunately for ESPN, Chad had none of it. He sat calmly on the pit box, Jimmie regrouped after the bobble, and the 48 team held its position until the next round of pit stops. Nothing happened, much to ESPN’s chagrin. It was at about that point when I had enough of this script and moved onto Hotpass. What I saw there for the rest of the afternoon was ESPN's script continuing to unravel right before the world's eyes. Jeff Burton crashed. Greg Biffle struggled. Jimmie Johnson got back the lap he lost in the pits, and after a late-race tire change …. gasp…..wait for it…… Jimmie finished 2nd! The script completely blew up, and at the end of 500 miles Jimmie had actually EXPANDED his points lead. He now has a full-race lead (assuming he starts of course). The 4+ hours of ESPN prognostications of doom and gloom for the 48 team had just been proven wrong. ESPN had just blown it…. badly. The climax of the storyline they pushed for hours and hours had never materialized. The entire race production built around that pre-determined storyline had been proven to be nothing but a gigantic waste of airtime. It's this unscripted nature of NASCAR racing that we saw today that makes ESPN's scripted approach to covering the sport that much more laughable. ESPN tried and tried to bring the hype. They wished and wished that the points race would tighten. AND IT NEVER HAPPENED. I hate to even imagine what ESPN could possibly have up their sleeve next week at Texas. What direction could their script possibly go in next after such a colossal blunder? Are we going to see this same ridiculous charade played out all over again? Is ESPN going to spend another four hours telling the world things like "Jimmie's going to finish bad today and make this an exciting points race!”, “Chasers tend to finish bad at Texas and Jimmie’s due for bad luck!”, and “Jimmie’s car isn’t that good this week!". Would they even dare try to insult our intelligence like that again after that exact same storyline blew up in their face just seven days prior? Maybe they'll play the "Jimmie Johnson might get locked in his RV or locked in the bathroom and not even start the car" angle instead? Perhaps they’ll dig into Chad Knaus’s past transgressions and play the "the 48 car might be found illegal in post-race tech and get a 150-point penalty" card? God forbid do you suppose they would even consider playing the "Jimmie Johnson could get injured” card and queue videos of Terry Labonte breaking his wrist at Phoenix in '96 or Sterling Marlin breaking his neck at Kansas in '02? I sure hope not. The bottom line here is that scripts don't work in this sport. ESPN needs to get back to basics and REACT to what happens on the track instead of trying to create their own show by forcing pre-determined storylines on an event they have no way of predicting the outcome of. Trust me, this sport is great and the unscripted stuff that plays out every week is entertaining enough by itself. If ESPN's not going to relax and start covering these Cup races as unscripted sporting events then I say it's time for them to move on. NASCAR needs to play the "buyout card" on ESPN the next time they dare play another one of these ridiculous “scripted outcome” cards during a Sprint Cup telecast. Today’s debacle was nowhere near acceptable. Just like all the NASCAR TV networks are different on the air, they are also different behind the scenes. SPEED only has the trucks, their crew at the Cup races does not have to produce the race. You can see that they have a lot of fun and have no pressure. During this time of the year, the ESPN crew gets to do 17 Cup races. They have all kinds of Vice Presidents, Coordinating Producers, Senior Producers, Line Producers and tons of announcers all over the place. ESPN has to live within a huge set of guidelines from the corporation that sets everything in stone from what clothes the announcers wear to who they can and cannot talk to. I am on the cannot talk to list. SPEED, on the other hand, emails me personally with all kinds of info and keeps me up to date when something changes. The ESPN guys who originally read this blog last season got really mad at me. Then, they did something about it when they realized all of you were here too. They made a lot of changes and this season there is no doubt there will be some more shortly. SPEED, as you know from TWIN, responded almost directly to the issues we brought up about the format and the preview/review stuff. The ESPN guys are battling uphill. Marty Smith and Ryan Burr do not want to be wearing suits and ties in the middle of the Cup pits on a Friday, but that is the dress code. Both of those guys read this blog and are very responsive to your comments. Needless to say, the folks stopping by and not leaving a comment may be the ones being discussed. I just thought it would be a good idea to get the fans thoughts out in the open and I am not afraid to lead that discussion. When people go out of their way to yell at me, they just don't want to talk about the topic. So, keep commenting because they certainly are....out there! Just once this season, I want a thru the field starting at the back and going forward. Even if like today when Riggs was in the garage. We don't care if the drivers are laps down, one or more of them could be our drivers. All of the drivers have a story and we'd like to hear it. This information could easily replace those filler video segments. Thanks for the answer JD even though I deleted my comment. I think I beat you to it with my last sentence. I didn't know you had been blacklisted by ESPN's nascar department. I guess they didn't appreciate someone criticizing their work. We really do appreciate all of your effort and hard work to bring the races to us. Many things come of as nit-picky, and if that's all there is to complain about, then things are doing well overall. 99% of the comments are constructive criticism and should be taken that way. Thanks again for your hard work. Thanks for the info JD. But ESPN has so much rigidity in their coverage that it kills the FUN of being at the race and turns it into a "professional" atmosphere. While covering other sports you can visibly see ESPN having "fun" over there. I think some higher up ESPN brass got talked into bidding for NASCAR and part of the plea was that it is a "professional" atmosphere. I get a little sad switching from RaceDay to ABC. The fun factor just dies. First, I want to echo Alex's appreciation comments to everyone who works to televise the races. Unfortunately for ESPN they were left with egg on their face, as over 50% of the smart race fans that responded picked Homestead, thinking logically that he'll be in one of those "finish 35th or better to win the title" scenarios and will ease home in the finale. stricklinfan~ At the rate the 48 team is going now, Jimmie quite possibly could hoist the Cup in Phoenix. Wonder what that would do their script? JD~ I also noticed the frustration in DJ's voice. I'm in the group of people that cannot believe how one company can produce virtually the same product in two different ways back-to-back. I watched the first 75 laps or so of the Cup race, turned it and kept up online and by radio, then returned for the final 10 laps. Why do the guys @ ESPN have to wear suits? Racing is such a laid back sport. When has anybody ever seen a fan at the races in a suit? Or even dress pants and shirt? Now that I think about it, it kind of makes them look like snobs. Is this the image ESPN wants? Hell, even Emperor Brian wears a rumpled shirt at press conferences. Since we know "they" read TDP I hope they take our comments to heart. Loosen up ESPN. @ Ben Cooper, props for apologizing. Btw, I want to thank all of you for the nice comments about DJ. It warms my heart since I am still his fan. He's the main reason I watch Cup racing. I appreciate your comment so I can clear that up. ESPN has a big Public Relations staff that deals with the media. ESPN/ABC is a very big company and employees do not speak for publication with bloggers. That is one reason I leave the Anon comments open despite the hassles. There is no ESPN blacklist, they are so big they actually have a media website where writers go for information. The ESPN PR staff sends me and many others an email every week of what NASCAR shows are on the ESPN Networks. They also answer my questions anytime and are very professional. While the ESPN TV headquarters are located in Bristol, CT the PR group is located in Celebration, FL on the DisneyWorld property. Thanks for the explanation, On second thought I figured it probably wasn't as simple as I made it sound. Good to know they're keeping you in the loop with PR and not taking criticism the wrong way. Like I said a few posts above, the purpose of this blog is constructive criticism to improve the whole Nascar TV product. All I can say is to those that think we ESPN-bash. SPEED got criticism for TWIN as well as FOX got it for...wait for it...DIGGER! ABC seems to go overboard in hyping Montoya. It sounded like Punch was going to get emotional when Montoya wrecked. First , i find it very sad that people really believe that a stock car race is more important than a political debate , a debate that will help determine the course of many lives . After 4 hours of hearing the words Jimmy Johnson and sunoco repeated at every opportunity ( still wonder why the tire manufacturer is never mentioned during pit stops ) its no wonder people question the integrity of the broadcasts . I think the split screen could certainly be used more than it is . There is never any viable reason to ignore any competitor , especially one who has fallen out of a race . Keep Johnson on one screen , interview the driver who fell out on the other . I'm sure that tv types do read this blog . My question would be , why aren't the major complaints by fans ever resolved . Overwhelmingly , the fans write that they want Bestwick in the PXP role . Doesn't happen . They want full field rundowns during the race . Rarely happens . They want coverage of all of the drivers , not just a handfull . The Atlanta race showed thar we're further away than ever on that one . Do the tv folks not read these blogs , do the ones that read them not have the power to change things , or do they simply not care what the viewers think . After years of this , i'm leaning toward th latter . There's no reason that the "important political debate" has to pre-empt part of a four-hou sports event. It can started after the event ends. Yeah, it's still a Jimmie Johnson lovefest over at ESPN/ABC. What would have happened if Jimmie dropped out? I wonder if they determine a second story ahead of time. Also, what's nascar going to be like next year with the economy like it is and most of the broadcasts this year not showing a lot of the cars in the field. Hmm, only 3 or 4 sponsored cars running but you can be sure JJ will be up and front on the tv. I also agree with Dot there were too many folks in the booth. I believe that the solution to ESPN telecast problems lies in the midst of your notations. The 11 "voices"! It seems that ESPN believes that "more is better" and that somehow, if there are more on-camera faces then the event appears to be more important and bigger....perhaps to satiate pressure from NASCAR? Maybe they lack gearheads on the staff and try to put 'sticks and ball'people on the telecast production staff. Whatever the source of the trouble, it is evident that ESPN care not about race fans and are either arrogantly indignant about this type of forum criticism or are dancing to the tune played by NASCAR Media people. There were thousands of empty seats in Atlanta yesterday....including right on the front stretch!! For those supporters of ESPN on this blog (who I suspect are employed there)who attampt to legitimize the Chase-only coverage, I respectfully submit that the ESPN disregard for coverage of the entire field is a contributing cause of the demise of such colorful but struggling individuals such as Robby Gordon and Kyle Petty. Admittedly, these drivers do not have great performances in recent years, but they are competing and they have significant fan bases. Maybe, at the close of the day, ESPN are actually hoping that NASCAR will ask them to bow out of their contract so that we can see more Sportscenter, Sportscenter, ESPN News, Sportscenter, Poker, Fishing, Southwest Florida A&M vs Western Carolina A&T and Sportscenter. One other thing that DSPN totally neglected is that the great Bill Elliott is within 3 races of finishing his illustrious career. You think that could have gotten a mention? And please, don't blame Jimmie Johnson for DSPN constantly making him the story. He didn't write their script. And to the early post in the blog about Carl and Jimmie and the pit road antics - Carl said on an in-race interview that if he were in Jimmie's place he'd be doing the same thing. It was not illegal. You get an advantage - you use it. And just one last thing: dESPN - your coverage is an insult to any race fan that knows anything about racing. Excellent and concise column John. As 3bud said above, WCVB in Boston did the entire race which was a good thing! However, I think its the picture posted with your column - check out the view from the windows and NOT the monitors and you'll see just why ESPN gives us such horrendous coverage. Punch has got to go and I am shocked that ESPN didn't figure this out early into their part of the season. ESPN continues to give us sub par coverage and will continue to do so if NASCAR doesn't cut in and tell them their coverage is lousy. The Chase is the Chase, for better or for worse, but as in all the other races covered by the various networks during a season, there are 43 cars in each race - resetting the field is not hard - following one driver is a slap in the face. Did anyone, besides myself, experience any technical difficulties with the broadcast? It seemed certain cameras (especially on the race start and restarts) were not working properly. I have Dish Network. I did go to other channels and didn't experience any problems. The picture was "jerky" like it was being fast framed forward. So was the running order on top of the screen. It was really annoying. Dopes ESPN expect everyone who is not a fan of a Chase driver to justs top watching when the Chase starts? If so, they're doing a good job. Of course, the ratings will tank if everyone who follows one of the 31 other drivers still racing stops watching, but maybe that's okay with ESPN. You can swing over and look at the comments in the in-progress post for the Sunday Cup race. DISH Network again had problems and those who contacted DISH left their comments in the post. There were no technical problems with the broadcast on ABC. As has been the norm lately, the #48 seems to be the only car on the track. So therefore I did what I've been doing a lot lately. Watched football while switching to na$car once in a while to check on the race. Just what cures your ails. A boring race complete with cars that can't race side by side, boring tracks where hard racing is nonexistant. If you're a Johnson fan, more power to you. But for those of us who actually follow other drivers (yes ESPN, we do exist) this race was far from a must see. What a sham na$car has become. ESPN coverage of JJ makes sense to me. I watched NN and they featured a few minutes of the print press corp asking driver questions. They wanted Jimmie Johnson. At one point the press was asked if anyone wanted to ask Denny any questions. No. They all wanted to ask JJ questions. He was their story. He is the story. The story is in newspapers all over the US today. They are not ESPN newspapers. Only once in the wonderful history of NASCAR has any driver done what JJ is trying to do. Not even the royalty of NASCAR, Petty and Dale Sr were able to do it. I wonder what's behind all the anit-Jimmie I read in this blog? He's a nice kid from a family who lived in California in a trailer park. He has no NASCAR pedigree and yet from the start, he was superb. Here's a guy who has an average finish (year) of 3rd for his entire career. The story is, will he finish first? We know from other sports, Tom Brady and the Pats, that we don't give the trophy to anyone until the end. I think the media was bitten once and don't want that to happen again. That's why they hedge their predictions with the facts. Mathematically, he can fail. And if he does, then Edwards and Biffle will be there. The cup championship is a jouney. It's not something that happens in one race when you get to Florida. I want to see that journey. Just like I like to see Tiger Woods. Very often Tiger is not on the leaderboard on the first day. Yet, I and millions of others want to know where he is. Sure he's on the leaderboard on Sunday, but we want to know how he got there, day by day-- in Jimmie's case, lap by lap and race by race. Sadly, even if JJ wins, he will not be the face of NASCAR. It will still be Jeff Gordon and Jr.
"With a masterful final drive to the checkered flag, the two-time defending champion rallied from a rare penalty to finish second and stretch his points lead to a commanding 183 points over Edwards with three races remaining in the Chase for the championship." Since when is a speeding penalty rare? Is that like the mythical home run or field goal? ESPN/ABC should re watch their broadcasts of NACAR from the 1990's. Those were excellent. Like everyone else says, switch Allen and Jerry's positions. That will be a big improvement. I'm not an ESPN/ABC fan boy but I like them because it makes me remember of Bob Jenkins and Benny Parsons together. What is statement is that the 2 time champion has rarely made such a mistake. Therefore a rare penaly on JJ, not the field of drivers. You have made the perfect example of confusing the coverage of a news story with the coverage of a live sporting event. That is exactly what my column reflects. Two things that should never be joined have been and ESPN is paying the price. This is not SportsCenter, this is not ESPNEWS and this is not NASCAR Now. This is a live event and it should be covered for what is actually happening, not what the news stories are. This has been the Achilles Heel of ESPN in the same way that not showing the cars finish to create "drama" kills the Fox broadcasts. The production teams are using NASCAR to fulfill their own agendas. Fox loves phony sports drama and ESPN believes it controls all sports news. Just look at what just happened with Brett Farve and his infamous phone call. ESPN refused to report it. This company is in crisis where several major sports are concerned. One of them is the NFL and the other is NASCAR. What ESPN did to Monday Night Football last season should have resulted in the loss of the contract. What ESPN is now doing to NASCAR is criminal. To somehow believe that there are millions of fans tuning-in to watch three or four cars battle it out for the championship is beyond naive. Last season, ESPN showed-up in late July and started their coverage by telling us what drafting was and what a shock absorber looked like. Hello! We have been here since February and all have our favorite drivers that do not change regardless of whether or not they make The Chase. Why should 31 teams suddenly become invisible just because 12 are running for the title? When you see ESPN start to only show the quarterback after he passed the ball for a touchdown or only show the pitcher after he has thrown a third strike, then you will know ESPN is applying the same NASCAR Chase coverage philosophy to the stick-and-ball sports they love so much. I used to watch every second of every show and every NASCAR race that was on....this year, I've not yet watched an entire 'Chase Race'....I used to have no problem with the 48 team, but I could do without hearing about their every decision during every part of the race (ie...oh, see the 48 blocked the 99 in the pit, so 99 got beat off pit road...). The TV over-saturation of the 48 bunch ( a bunch of commercials, a couple of different TV shows, etc.) has pushed me from lukewarm on them to waaaaayyyy cold. I wonder what's behind all the anit-Jimmie I read in this blog? No one is necessarily anti-Jimmie. We're pro "the entire race." When there are 43 cars running, we want to see the field covered, not just one driver. Let's put it another way: JJ is not my driver. I don't stop following my driver even if he's not in the Chase. I am not going to become a Jimmie fan even if he's leading in the points. Should I just stop watching and going to races during the Chaee, then? That's what ESPN assumes is going to happen, because they appply their stick-and-ball template, which doesn't fit in this case. When the race ended yesterday, I was just plain sick and tired of hearing the name Jimmie Johnson. He is a great race car driver. He is probably a really nice guy. And the charge he made at the ended was incredable. But ESPN worshipping the ground he walks on is just too much! The sun DOES NOT raise and set in his hind end! I would bet that his name was said at least 1000 times in the course of the race. Enough, already! i am in no way a johnson fan (in the interest of full disclosure, my team is the #88) that being said, it makes me sad to read that folks are sick of johnson when, as another johnson intimated, the problem is the relentless fawning over him. it's not his fault, he can't control how the nascar media reports on him and i'd bet a fair amount that he wishes they'd just scale it all back. as i've seen with earnhardt jr and with the hendrick organization last year (remember when they were winning all the races, not toyota? and folks were fed up with hearing about hendrick?) now, it's being dumped on johnson. espn has just gone so far over the freakin' top with it and the atlanta broadcast was frighteningly bad from that perspective. nascar has messed with our sport by introducing the cot and then handcuffing teams on working with it. espn has severely damaged our sport by their insistence on staying with some pre-determined script at the expense of the actual racing. as someone posted earlier: broadcast the race. let the story unfold as it's been unfolding all season. don't worry about talking points or film packages or graphics or trick cameras. just point the cameras at the track, look for the racing in the pack and tell us what's happening right then, right there. if espn (and other media partners!) can manage that, then the #48 team's accomplishments these past three years will be recognized by fans across the board. I am not a fan of Jerry Punch. In fact, I think he is just awful in his current position. But of all the things he does as an announcer that irk me, none bother me so much as when he calls Carl Edwards "Cousin Carl". I hate it, hate it to my bones. It's the silliest, most childish thing I've ever seen a broadcaster fixate on. Every time Punch says "Cousin Carl" I just want to throw something right at my TV. I honestly don't know why the reaction is so visceral, but I really hate it -- and I don't even like Carl Edwards! "With all the cars on the track, shouldn't all of the teams be treated equally by the TV crew and the announcers?" Honestly? NO. They shouldn't be treated equally. The Kansas City Royals don't get covered like the California Angels, the Jags don't get the press that the Steelers do, the Golden State Warriors aren't on the national radar like the Lakers are, and the NHL hardly gets covered at all. Just because you are in the big leagues doesn't mean you get a lot of coverage, except in the home market. Just because a car shows up on Sunday doesn't mean they are a story. If the Pirates, Texans, or Nets, or Dave Blaney, Reed Sorenson, or Ken Schrader want to be covered, they need to win, or at least get close. You couldn't pay me to watch the Lions against the 49ers, and the only reason I care about any car running further back than 15 or 20 is if it is someone surprising-one of the top teams having problems or something. It is clear you are not a NASCAR fan who has a favorite team. Most fans have stuck with the same driver, like Mark Martin or Ryan Newman for years. Just because those drivers are not in The Chase does not mean the fans don't deserve to see them and have their race recapped at regular intervals. Over and over again ESPN fans have tried to lay stick-and-ball analogies on us, but they do not work. If you are Tiger Woods fan and you tune-in to find out he is five off the pace because of some earlier problems, does that mean he should be excluded from the coverage because he is not in the top five? I kind of agree with you. However, a mention now and then about an odd wad would be nice. Stars like Tiger or JJ are never excluded from a broadcast. No matter where they are, fans want to know. That's why all networks feature the marquee players in all sports. That is totally untrue. On a Sunday of a major, if Tiger is not in it, they will only show him if he makes an incredible shot or putts out on 18. And that goes even more so for every other star in golf -- if they are out of the hunt, no, they do not get the coverage AT ALL, so bad analogy. I guess we don't realize how good Dale Jarrett is. He seems to excel in most everything he does, which is very commendable. If ESPN would just pay attn. and put people where they belong on their broadcasts, we would probably cut them alot more slack. Are you kidding me? Exactly the opposite is correct and for a the very same reason that ESPN is wrong for just showing The Chasers. Fans are not going to change the golfer they pull for just like NASCAR fans are not going to change the team they came to watch. Whether or not a certain team made or did not make The Chase should not suddenly kick them off the TV screen for the final ten races of the season. That is ridiculous. Show the race and update The Chase should be the ESPN on ABC motto, not show The Chasers and dump the racers. Racing is not something you can compare to other sports. However, I am going to take this golf example and run with it. Say some oddball golfer makes an incredible hole in 1, he can be 15 strokes back but the network is GOING to talk about what he accomplished. The same standard should be held true in a NASCAR race. If a driver in the mid/rear of the field makes a great pass or has a good little tear through the field, it should get some coverage. You don't have to stick with the guy all race, in fact the beauty about racing is that you can find action anywhere if your willing to look for it. Cover your chase guys, they've accomplished alot by making the chase, but no one wants to hear about it every single second of the broadcast. You make some very good points. If a driver always runs 38-43 every race, why should they be featured? By the way, I have the golf channel, and have not seen a match yet where Tiger is not only mentioned, but clips of him playing are shown! I don't care, cause I'm a big fan. Just so we are all on the same page, 36 cars start and 6 get provisionals. What we are talking about is cars 13 through 36. Do you know who is battling for the top 35 in points? Do you know who is battling for rookie of the year? How about the Manufacturer's championship? You guys are hilarious trying to say that only 13 cars should be shown during a race that goes for four hours. No excuse for bad TV coverage now in year 2 of ESPN on ABC. JD remember when ESPN aired coverage the first time? On their scoreboard they would update the top 25 in points (all the way to 30th i believe) as well as ROTY, and other important battles in points. Why can't we get that now? Those questions, with the exception of the manufacture battle are answers I know...but thats because I use all my resources to find out. That, and I am a AJ Allmendinger fan and when he was in that 84 I followed their amazing progress to crack the top 35. But yes, with just watching the race alone many of those battles are forgotten. Hopefully some adjustments are made for 2009. ALL the networks have work to do but its doable for all of them. In the first ESPN TV contract, when I worked on the road I sat right next to the graphics guys. They would spend the whole race loading info by hand on who was where, no computers back then. We prided ourselves on peeling back from the leader to find the racing after every restart and then sticking with the best racing on the track. Meanwhile, the graphic guys would try to update several pages of leaderboard into commercial or coming out of it just to keep fans up to date. To see the over-hyped myoptic coverage of this Chase has been amazing. I guess the media hype generation has invaded NASCAR like they have for other sports.